Remains of a well preserved 6th C Byzantine church in Tefen area. The structure was probably part of Khirbet Mehoz. Remains of a secluded Byzantine church on the north bank of the upper Beth-Haemek creek near Khirbet Mehoz. 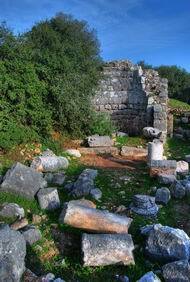 The ruins are in good condition and mosaic inscriptions were reconstructed and date the structure to the beginning of the 6th C.
The site of Khirbet Heshek (Kheshek) is located in the area called Tefen, near the brook called Beit Ha-Emek ("house of the valley"). A junction of the modern road (#854) to Ma'alot, Kishor and Carmiel is located nearby. About 200M to the south is another Byzantine site - Khirbet Mehoz. The access to the site is thru Mehoz, by climbing up the hill. The site was first established in the Byzantine period (4th-7th C AD). It may have been a monastery which operated by the side of the farmers village of Mehoz. During the Persian and Arab (7th C AD) conquests the site was destroyed. In the Crusaders period the church was rebuilt. 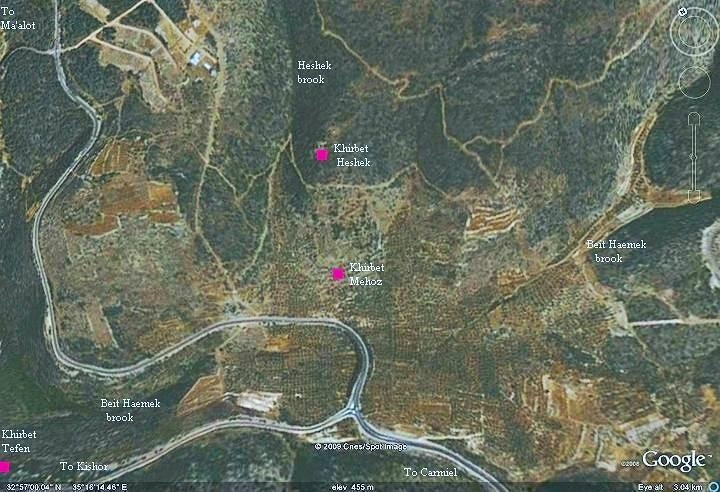 The site was surveyed by the archaeologist Dr. Motti Aviam as part of the archaeological survey of Israel. Webmaster Rotem: My Uncle Ronnie also participated in this survey and always praised this site. On the south side of the ruins, just above Khirbet Mehoz, is an access road that traverses the hill at this point. The 2 story structure is seen below, as viewed from the south side. The church is located on the second floor. In front of the church, on its south side, are remains of the balcony. A closer view of the stones that fell off the gallery above the church. The church is located on the second level of the structure. The narthex (entry way) is seen below, on the western side of the church. As can be seen, the structure is standing close to the edge of the gorge (named the Heshek brook). The central apse is seen in the photo below. On the floor are fragments of the columns that originally held the ceiling at a height of 3M. It collapsed after a fire burnt the wooden beams that once held the second floor gallery. The church had 3 apses which are facing the east - as in all early churches. A closer view of the central apse is seen below. Another view from the top of the apse is seen below. The large stone in the center of the apse was the base of the main altar's table. The floor of the church is covered with mosaics, decorated with geometric patterns in 4 colors. As seen in other early churches, 5th C churches are decorated only with geometric carpets, without figurative objects. The figurative decorations , such as floral, animal and village/hunting scenes, started only in the late 6th C.
A mosaic inscription was found on the floor of the church near the altar. The inscription dedicates the church to Saint George. George was born and lived in the 3rd C AD in the Holy Land city of Lod (Lydda), a city south of Ben-Gurion airport. He was an early Christian, served as a Roman tribune and died in 303. His coffin is located in St. George church (in Lod), where according to a 6th C tradition his remains are located. St. George is regarded as a martyr, a great Holy warrior saint, and is illustrated as a "dragon slayer". The Lod basilica was dedicated to St George in the Byzantine times, and later other churches were named after the great Martyr. 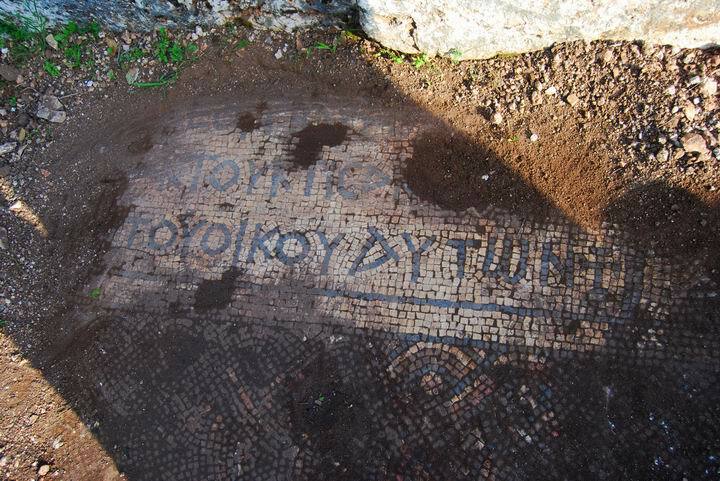 Another inscription in the floor of the narthex dates the construction of the church to 518 AD. On the floor of the church are fragments of the columns that held the ceiling. Other fragments are seen below. The lower floor under the church is built of hewn stones, with several small rooms. An entrance to one of the rooms is seen below. The interior of the room on the lower floor is seen below. A turtle is seen below crawling around the area of the church. They are often found crawling on the ground in the Galilee. Heshek - Hebrew for desire. The name of the ruins is based on the Arabic name - Kaser El-Ashak - the fortress of desire or lust (the reason for the name is not known, but you should have a desire to go and visit the site).